For the first time since 2009, the Washington Capitals will face the Pittsburgh Penguins in the playoffs. Last time the two teams met in the playoffs, Sidney Crosby's Penguins walked away with a Game 7 win over Alex Ovechkin's Capitals. The big names from that series -- Crosby, Ovechkin, Nicklas Backstrom and Evgeni Malkin -- are still with their respective teams. But a slew of new faces strewn about the two teams offers a new, fresh take on the heated rivalry. Take a look at how each team's units stack up against one another. In the Capitals' opening series, offensive contributions really only came from four players at 5v5: Backstrom, Ovechkin, T.J. Oshie and Marcus Johansson. The only other two players to record a point at even strength were Jay Beagle and Jason Chimera, and Chimera's single point came from a lucky half-ice shot that slipped between Steve Mason's legs. That spells trouble for the Capitals' second and third lines, which might see a bit of a shakeup in the Eastern Conference semi-final matchup. Marcus Johansson has been taking shifts as the second line left wing in morning skates, flanking Evgeny Kuznetsov, opposite of Justin Williams. That bumps Andre Burakovsky down on the third line along with Chimera and Mike Richards. While the second line wasn't directly putting points on the board, they were still creating scoring chances. In fact, Kuznetsov's 15 scoring chances in the opening series was the second-highest on the team, only behind Ovechkin's 18. Williams recorded the third most with 13, and Burakovsky had the fourth most with 11. That's encouraging, because while they aren't directly scoring goals, they are still generating threatening offense. And considering the large quantity of scoring chances the second-line was contributing, a few are bound to go in the net eventually if they continue pumping out offense. The forward unit for Pittsburgh is quite clearly its strong suit. It's led by big names Crosby, Malkin, Phil Kessel and Patric Hornqvist, but it's riddled with a tremendous amount of depth and little-known names. Conor Sheary, who has played in only 44 regular season games over the course of his entire career, is penciled in as Crosby's left wing on the top line. Sheary is only 5 feet 8, but he's highly aggressive defensively and will look to generate offense off of the rush. Sheary loves to force turnovers and create odd-man rushes, and his speed allows him to break away from the opposition more times than not. Nick Bonino filled in nicely during Malkin's prolonged absence at the end of the regular season. He closed out the regular season with 13 points in the Penguins' last 10 games, and he continued that production into Pittsburgh's opening series against the New York Rangers, finishing with five points in as many games. He will be joined with Carl Hagelin, who is another player that plays with a lot of speed. Bryan Rust, Tom Kunhackl, Eric Fehr and Matt Cullen provide a bottom-six scoring punch. Just how deep is the Penguins' forward unit? The bottom-six forwards managed to record six of the Penguins' 21 goals in the opening series. The shutdown tandem of Karl Alzner and Matt Niskanen was rock solid in the opening series. Despite starting the majority of their shifts in the defensive zone against the Flyers' top line, the Capitals were still able to generate more shot attempts than they allowed when those two were on the ice. Niskanen and Alzner will see heavy doses of Crosby, and if they can even perform at a fraction of what they played at against the Flyers, Crosby is going to have a very difficult time this series. Brooks Orpik is taking shifts at practice, indicating he may be ready for a return. If he's ready, he'll slot in right along John Carlson, whose three goals were a major reason the Capitals' power play was able to convert on 8 of its 27 opportunities. With Orpik's return, Nate Schmidt should slot in right alongside Dmitry Orlov, and the two should see favorable matchups that should help the Capitals generate offense. The Penguins don't have a shutdown tandem quite like the Capitals, but they do have a lot of puck movers on the blue line that will look to jump into the offensive play. Kris Letang will be the most dangerous blueliner in the series, and he will likely be paired with Olli Maata. That's two offensive-minded defensemen paired with one another, and if both jump into the offensive play, it could lead them to be susceptible to an odd-man rush. Trevor Daley and Ian Cole will serve as the Penguins' second pairing. Daley, whom the Penguins acquired in a trade with the Chicago Blackhawks mid-season, is another offensive-minded defenseman, but he's pretty responsible in his own zone. Ben Lovejoy and Brian Dumoulin will likely be paired against the Capitals' third and fourth lines pretty consistently. Justin Schultz, another offensive-minded defenseman, may see spot starts in the series. Braden Holtby continued along with his storybook season with another stellar opening series against the Flyers. Holtby's .968 save percentage and his two shutouts leads all goaltenders in the playoffs. That series raised Holtby's career playoff save percentage to .940, and dropped his goals against average to 1.76. In 17 of Holtby's 20 playoff wins, the 26-year-old goaltender has allowed one goal or fewer. 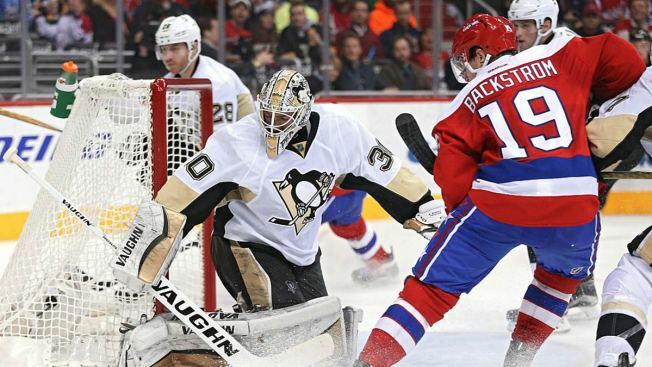 The Penguins' goaltending situation is a bit up in the air. Normal Penguins mainstay Marc-Andre Fleury hasn't made an appearance in this year's edition of the playoffs due to a concussion sustained late in the season. That injury opened the door for Matt Murray, who then proceeded to get a concussion of his own, causing him to miss the beginning of the playoffs. And that opened the door for Jeff Zatkoff, who allowed six goals in his two playoff appearances. Murray recovered from his injury, returned for the last three games of the series and walked away with three wins. He's good to go for this series matchup. But Fleury is still a bit questionable, although he has been practicing. If it is Murray who ends up going, that's a 21-year-old goaltender with 16 total NHL games on his resume. In those 16 games, Murray has managed to record a .935 save percentage. Murray also played against the Capitals twice already this season. His save percentage in those two games? It was .910, which earned him a win and a loss. And if it ends up being Fleury in the net, he's had a difficult time over the course of his career in the playoffs. In his 12-year career, Fleury has maintained a .906 save percentage, though in his most recent playoff effort, a first-round exit against the Rangers a year ago, Fleury held strong for a .927 save percentage.